was formed by David Jones in 1986 with the aid of the Princes Youth Business Trust. After a short period he was joined by Ian Smith and this partnership lasted for 12 years in which time they built a good reputation for their work throughout the bonsai world not just in Britain but Europe and the rest of the World. After Ian left to pursue a career in teaching, David worked alone up until 2005 when he was joined at the studio by Mark Jones. 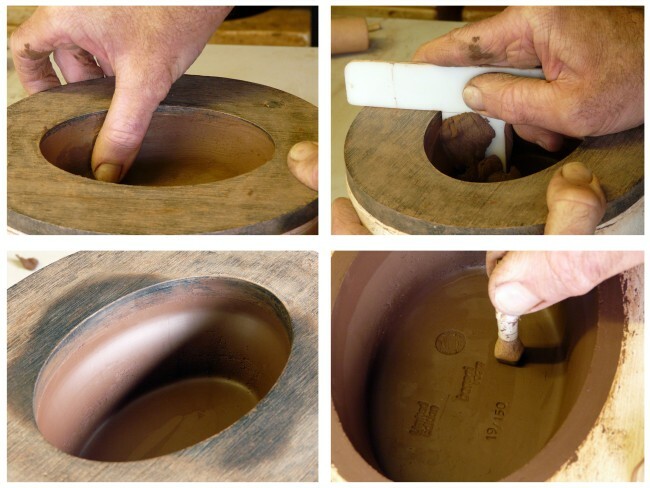 We use many methods of producing our pots, the simplest of which is slip cast. We mix our slip clay to our own recipe which has been developed and improved over many years. This slip is then poured into a plaster mould then left, depending on its size, between 1 and 6 hours for the walls of the pot to reach the desired thickness. The excess slip is then poured off and the pot left to dry until leather hard. It is then ready for trimming and to have any additional work done, and the pots are then left to dry out fully before fettling and sponging. 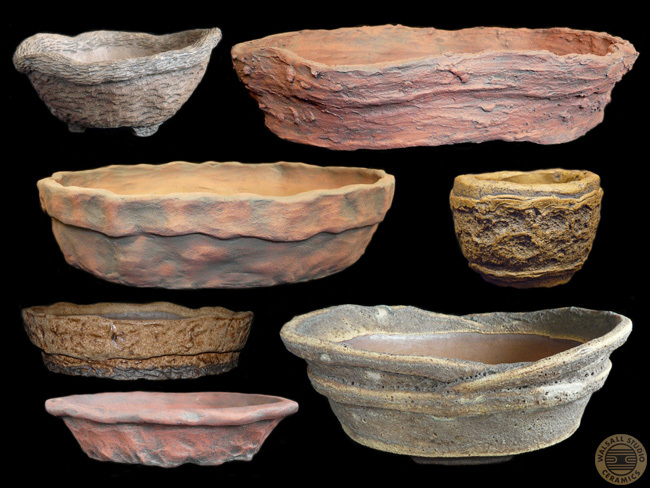 Our hand-made pots are made in a variety of ways. 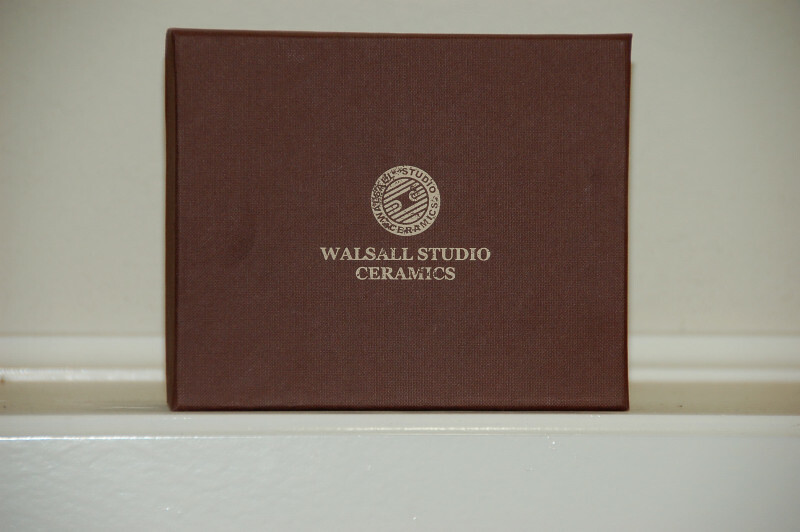 Our standard range are coiled or slab built into a plaster mould, which supports the soft clay in the basic shape until leather hard. 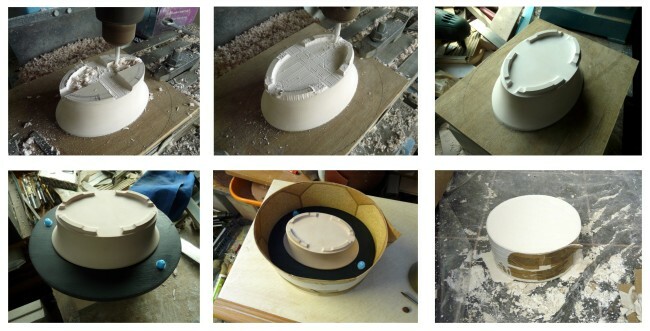 Once at this stage it is taken out of the mould and the pot is then finished to the desired design and surface finish. Commissioned pots are freehand built either by coiling or slab building depending on the shape and size. 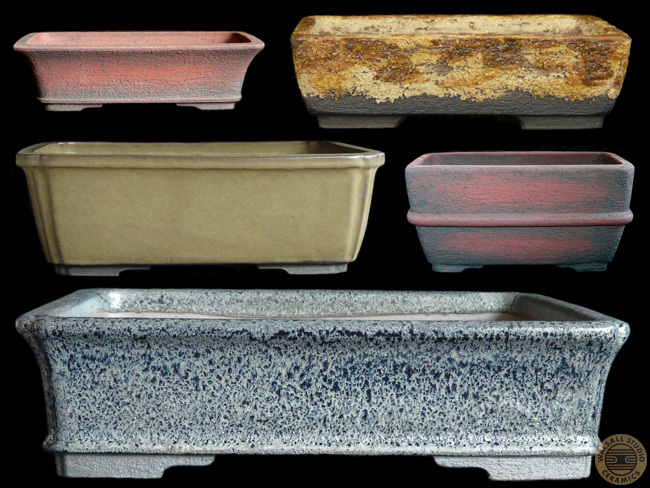 Back in 2010 Bonsai Focus Magazine commissioned us to make a special limited edition of 100 pots for them to sell exclusively through their magazine. 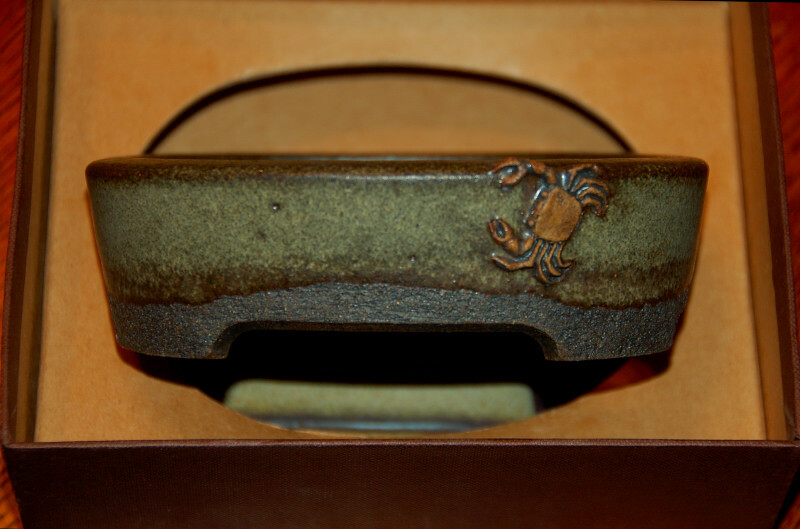 This proved to be very popular and so this year Bonsai Focus have commissioned us to make another limited edition pot. These handmade shohin pots are made using methods very similar to potters making Tokoname Bonsai pots in Japan and we thought it would be a good idea to give you a small insight into how the pots are made. 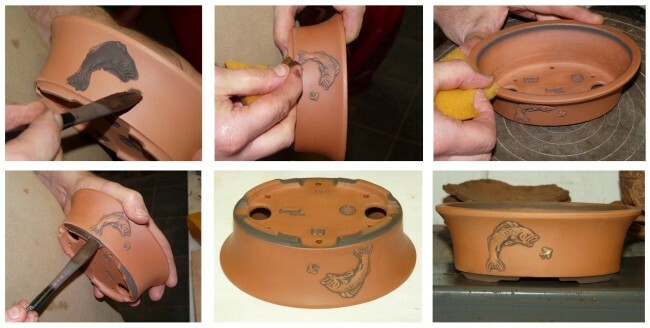 Here are a few photos and notes about the processes we use in the making of the fish pots. The first stage was to come up with the basic pot design, it was decided to keep the pot to a similar size as the first collectors pot which was a small handmade rectangle with a climbing frog on the side. 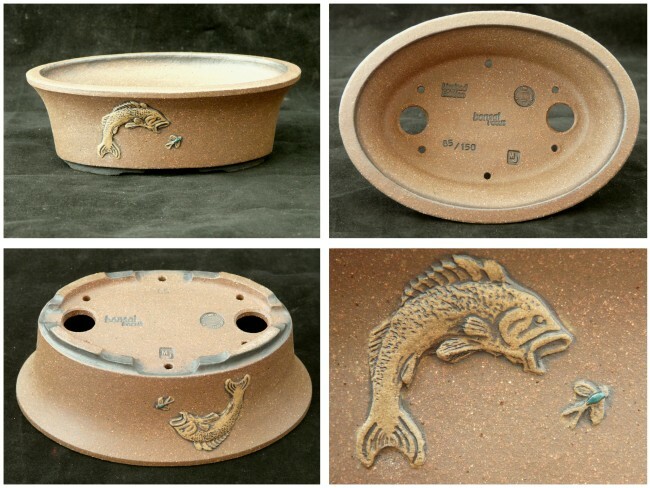 We came up with a few suggestions and in the end the guys at Bonsai Focus went for an un-glazed fluted oval with a fish leaping after an insect. 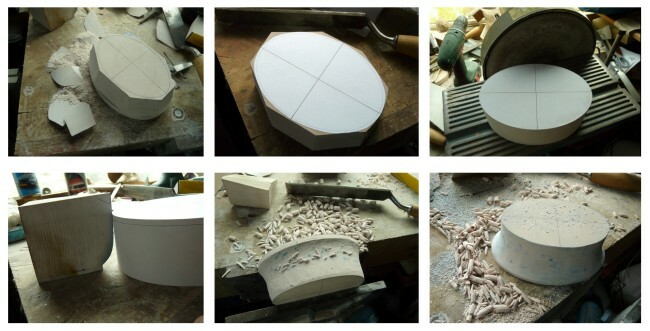 To make 150 handmade pots accurately the first thing we have to do is make a master model. We do this by first getting a block out made to the correct height of the pot, then mark on the top profile, cut away the waste and grind the model to this line. Next we make a template to the side profile shape and begin carving the sides of the model, checking as we go with the template and using a wax crayon to make the high spots that need carving away. The model is then sanded to get a nice smooth surface.The model is then fixed to a board, which will later be used as the lid to the mould. The feet are marked out and I use a miller to cut the waste away and then finish carving and sanding them by hand. The board is then cut and sanded to the shape of the lid, two plastic notches are put in to help locate the lid on the plaster mould and the model is them coated with a thin layer of Vaseline. 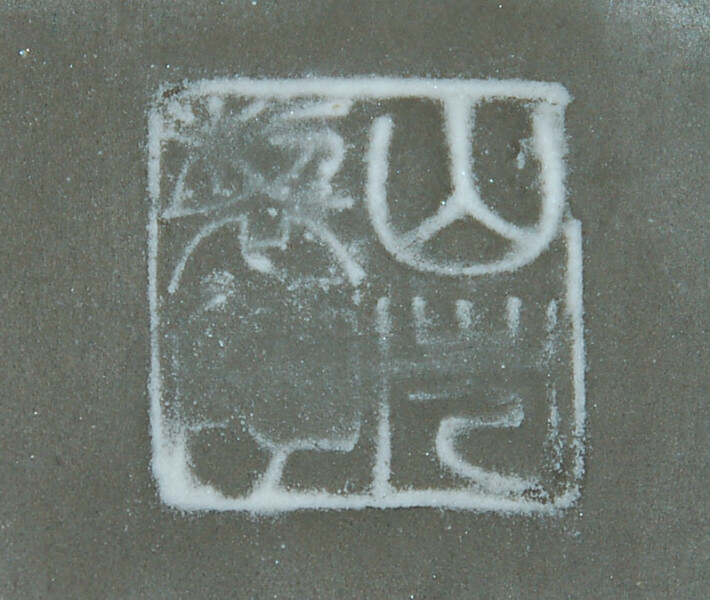 A sheet of plastic is wrapped around the outside of the lid to make the walls, and the plaster is mixed and poured in. Once this has gone off the wall can be removed and the model retrieved from the mould. The plaster mould is then left to dry out completely before we can use it for making the pots. The master models for the fish and insect were made out of Milliput which is a two part modelling putty that sets hard after approx 4 hours. Once the models had set hard a soft piece of clay was pushed over the models and allowed to dry for a while then split from the models and allowed to dry completely. Once fully dry it was fired in the kiln to 1000ºC which makes it hard and durable but still very absorbent. To make the fish and insect sprig, soft clay is forced into the mould and then smoothed off level, left for a while so the mould can absorb some of the water from the soft clay, and after a short time the clay dries out a little and starts to shrink. The fish and insect can then be fetched out of the mould and are ready to fix onto a pot. 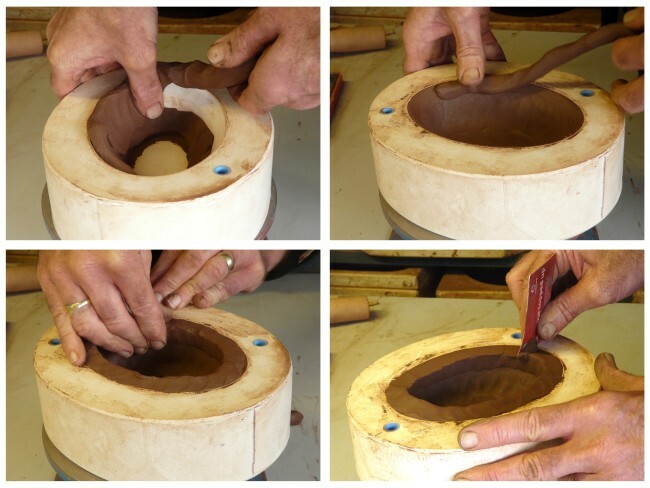 Coils of soft clay are pushed into the mould making sure no air is trapped as you go, also making sure there is enough thickness of clay to form the pot walls and the rim at the top. This is then smoothed off level with the top of the mould. The lid is then placed on the mould and the clay forced around to make sure it’s compacted hard against the walls and lid. We then use a template which has been made to the internal shape of the pot to scrape out the excess clay and compact the clay even more. Once all the excess clay has been removed the inner surface of the pot is smoothed over and the mould is then left over night for the plaster mould to absorb some of the moisture out of the clay. 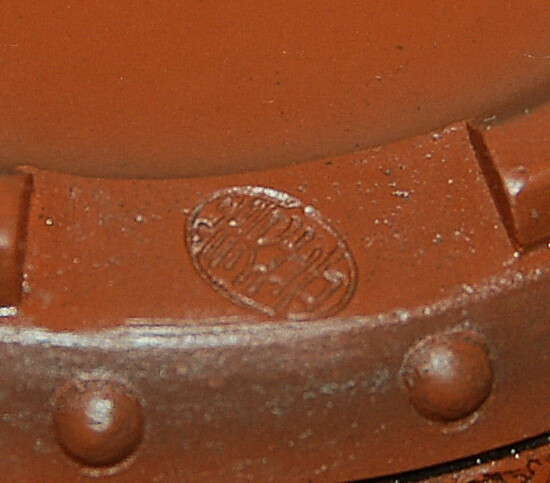 By the next day the clay has dried out enough to put the stamps on the inside of the pot and smooth and refine the inner top edge of the rim. 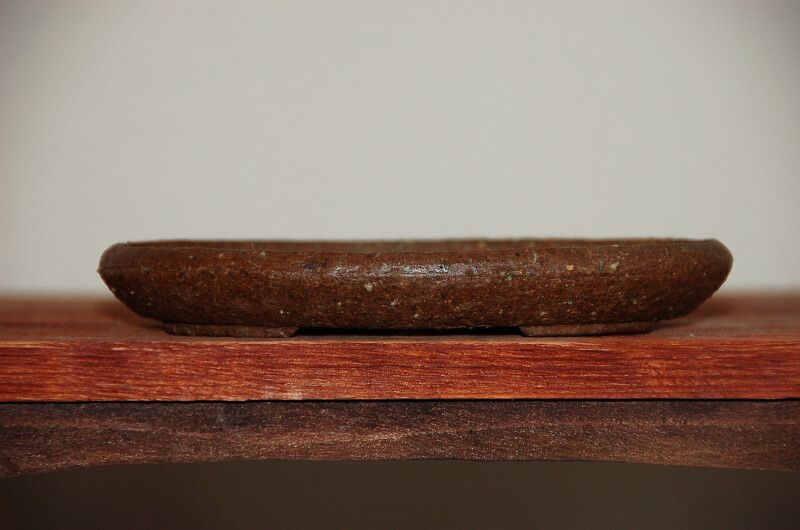 After another few hours the pot will have dried out a little more and shrunk away from the sides. It can then be taken out and work can begin on the outside of the pot. The pot by this stage is now leather hard, much easier to handle and the next job is to put the drainage and wiring holes in. 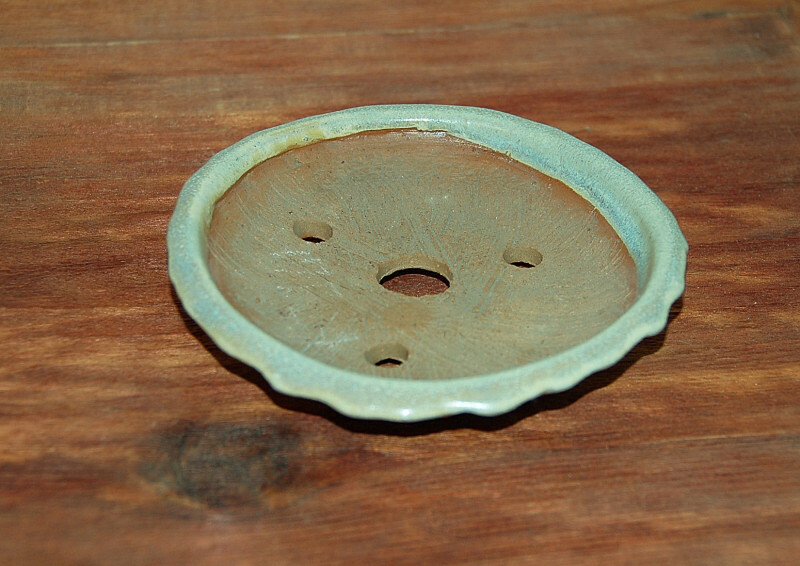 These are made by piercing the base of the pot with brass tubes sharpened to a point and then the edges of the holes are smoothed off, both inside and outside the pot. The outside of the pot can now be finished. The rim and feet will be refined and smoothed off and the outer surface of the pot smoothed and polished with a plastic kidney. 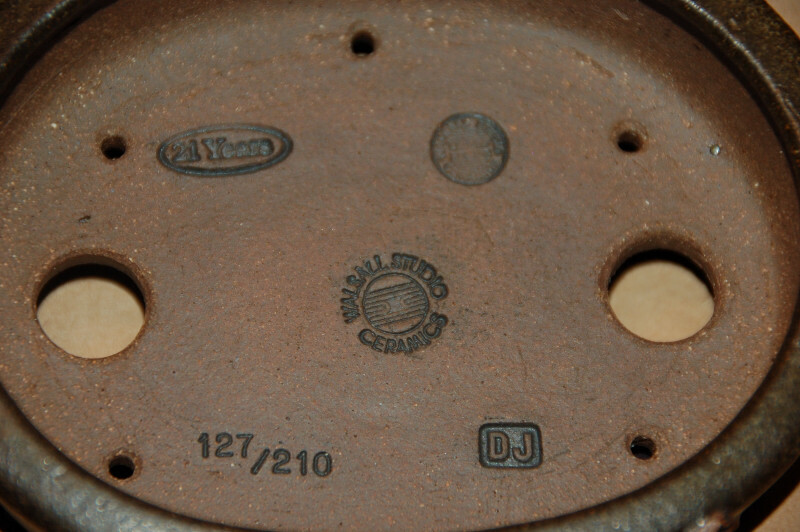 The pot is then placed over a support and the stamps can be put on the bottom. 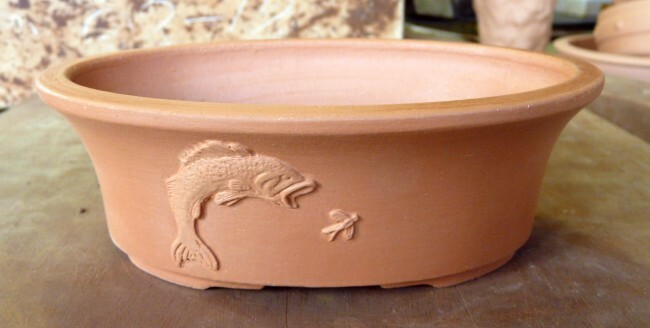 The fish and insect sprigs will then be made and fixed to the pot using slip. Once fixed and dried out a little the edges of the sprigs will be refined, the pot finally cleaned up and brushed over with a fine brush to remove any fingerprints or marks. The pot is then left to completely dry out over several days. When the pot is fully dry it can be biscuit fired to 1000ºC and this is when the final decorations can be applied. 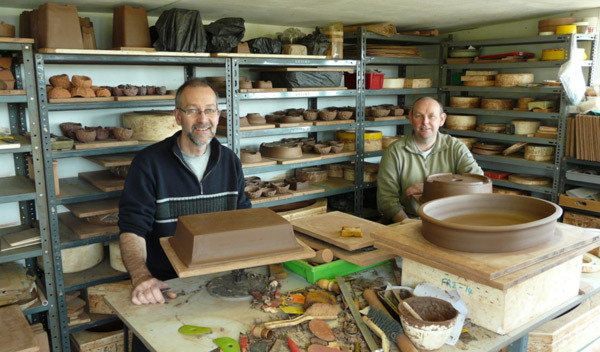 Once the kiln has cooled the pots can be removed and the final decorations can be applied. 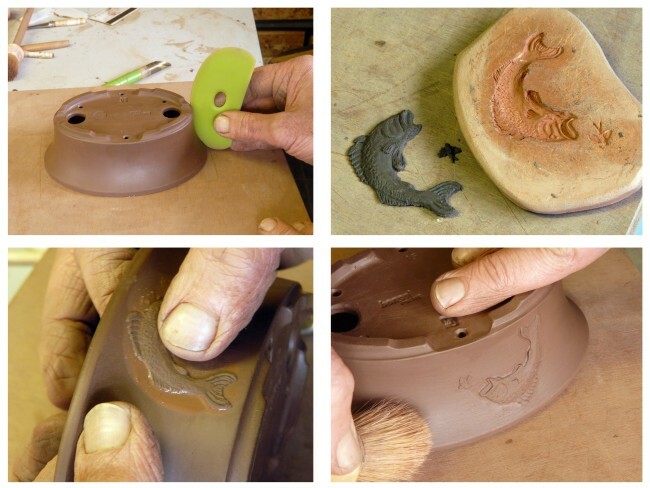 As the insect is the only part of the pot to be glazed, the dark iron oxide we use to darken the feet and highlight the detail of the fish has to be applied very carefully in three stages.First the oxide is brushed into the stamps and over the fish and the insect. This is then wiped over with a damp sponge to remove the excess. 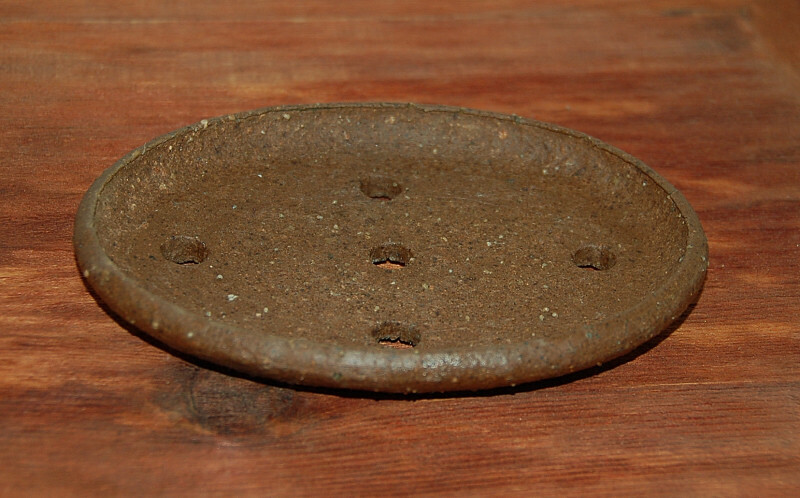 Then the inside of the rim is darkened and neatened up with the damp sponge. The third part is applying the oxide to the feet. Finally a small blob of turquoise glaze is added to the body of the insect and then it’s in the kiln for the final firing. The pots are fired to 1260ºC, which ensures they are both durable and fully frost proof, and finally inspected for any defects. If all is OK, they are placed in one of our presentation boxes and packed ready for dispatch. 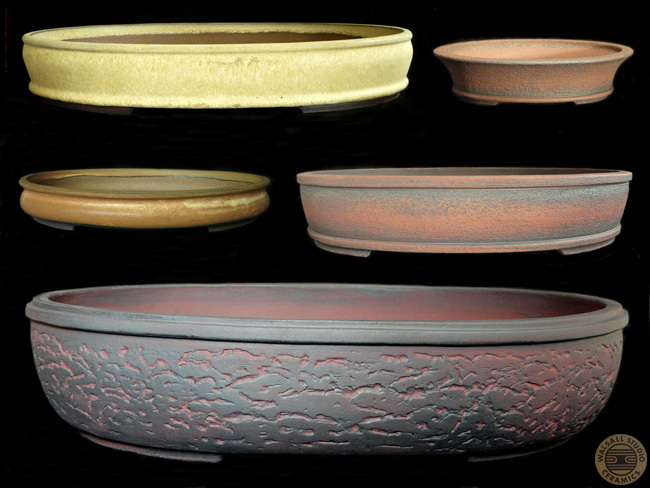 This limited edition of 150 pots was only available through Bonsai Focus Magazine . 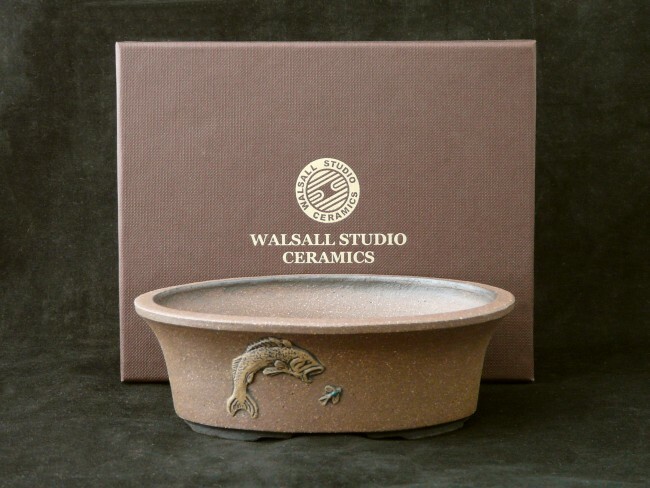 We hope you have enjoyed this little insight into just one of the many methods we use in making bonsai pots and hopefully you will return in the near future to see what’s new and what’s going on here at Walsall Studio Ceramics. 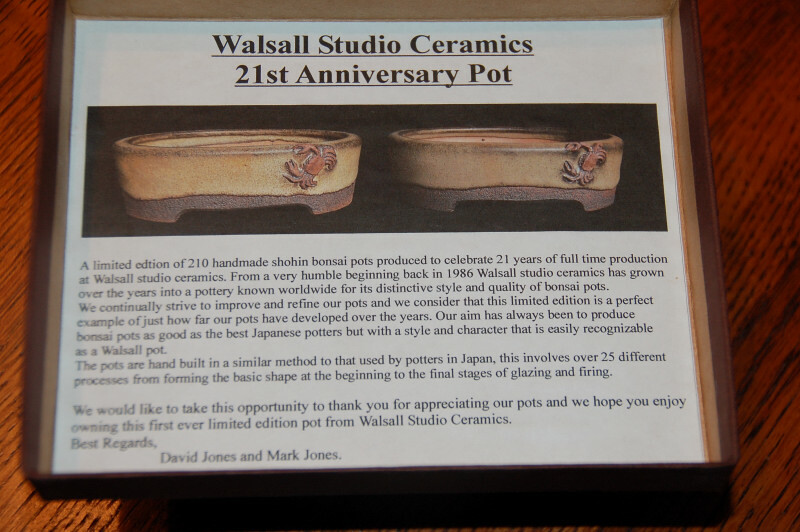 I had the good fortune of bidding on a Walsall Studio Anniversary pot celebrating 21 years in the business of pot making. The auction was held at the bi-annual Shohin Seminar in Santa Nella California. I have yet to think about potting in it, but maybe someday I will have something worthy for the pot. There are times when I can sit and watch videos of potters for hours at a time. I thought it might be useful to have a few to watch on a night your bored. I have started this catagory to highlight some pots I have picked up that are unusual and not seen often. Many of them I have never seen before and look handmade or actually maybe by a classroom of newly budding clay artists. 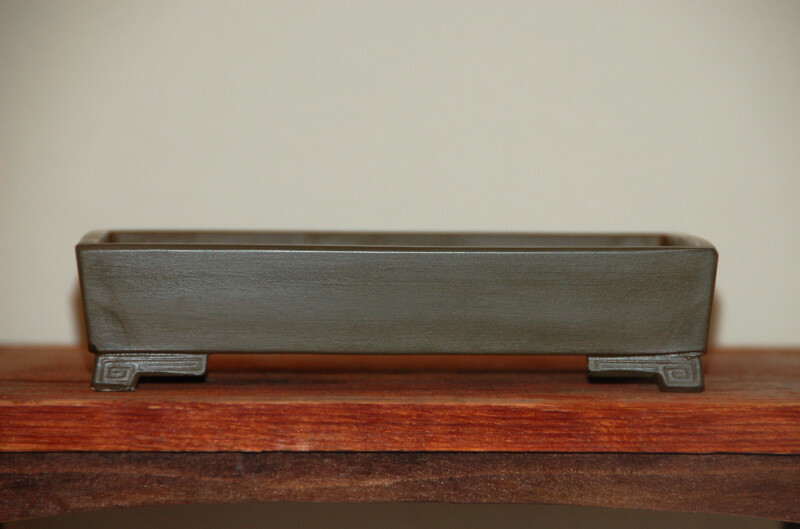 I mean really…how many ashtrays can one man own? At some time all these pots will be on the pots page, but for now I thought highlighting some of the unusul ones might be fun. This pot is special to me just becuase of the finish and the color not to mention the shape. I picked it up from Sharon Muth of Bonsai Northwest God knows how many years ago. I know I bought it at the shohin seminar becuase that is the only time I see her down this far. The pot is 8 x 6 x 1.75 inches. The color is a greenish grey and the clay is silky smooth. 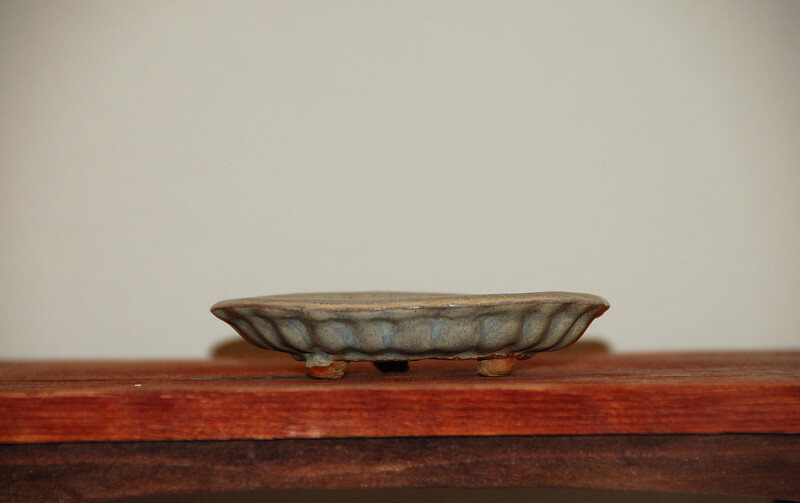 It seems burnished in Yixing ware tradition and the edges are sharp. 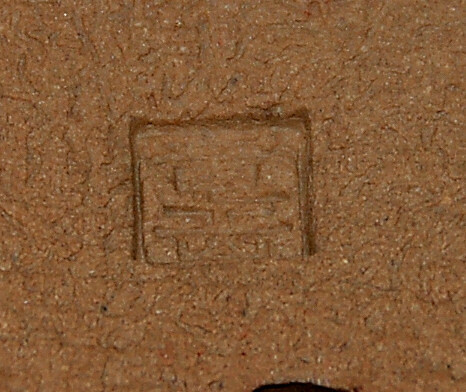 I am not sure about the hanko. It looks Japanese but the pot has Chinese touches. The design on the feet are traditional Chinese in design. As you look at the picture of the weak chop, and you know who this might be, drop me a comment. I would love to know the potter. 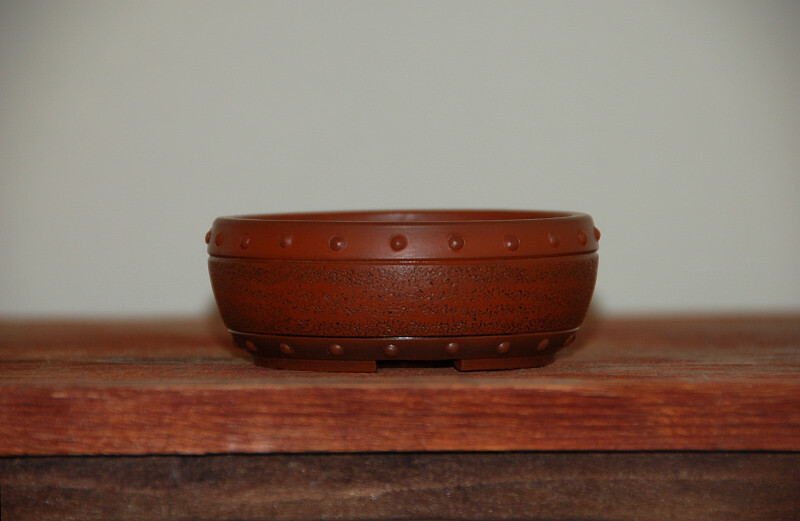 This small pot was one of the first Bigei pots I purchased. I purchased it because it had the most unbelievable finish and I had never seen a Tokoname pot up close and thought this is how all pots from that region would look. Of course I was wrong and I would soon find out that the quality of his pots are what attract collectors of his wares the world over. 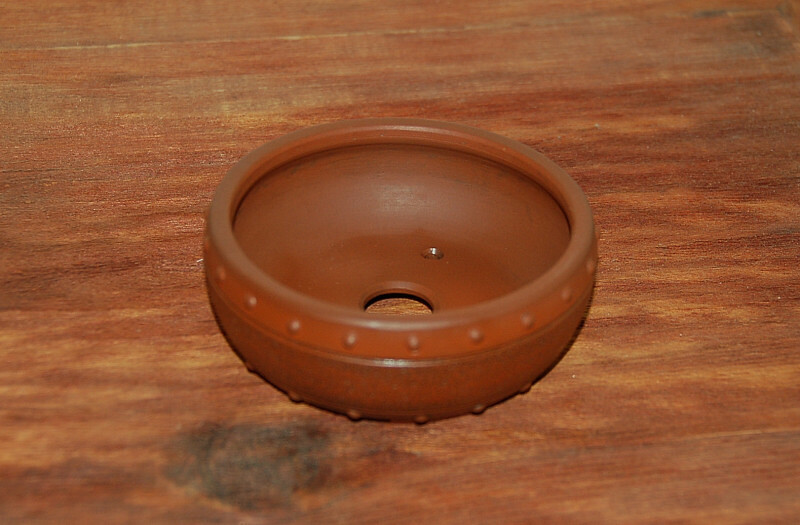 This mini drum pot is 4 inches in diameter and is 1.5 inches tall. I have planted in it in the past but have decided to retire it to the collection for the time being as I wait out the market on Bigei pots. I aquired this small shohin pot 29 years ago when I started. I was very fortunate to hook up with someone that knew everyone in the state and where all the cool stuff was. I asked for a list of places I should go and one of them was to see George Yamaguchi of Yamaguchi bonsai in north Los Angelas. A Japanese area in the North West of the city, much like the area where Chikugo-En is, which was another place on the list. Upon reaching the gardens I immediatly set out for the plants. I looked over everything and decided on a few. I came in to pay and found the pots. There was this pot that caught my eye. It is oval in shape and 7 x 5 x .75. the clay is very coarse and has very large pebbles in it that show up white on the photo’s. The pot is hand made, but has no chop. I know it is 29 years old but how much before that I have no idea. 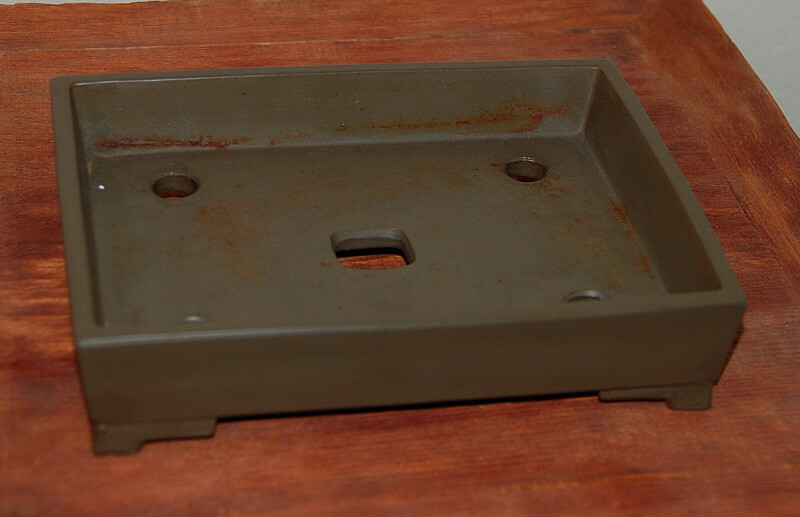 I bought this small accent tray about ten years ago. At the time I was very interested in making the moss balls as accents. I still want to do a formal display using one but have not had the chance to try it. This year at the Kazari may be the right time. Who knows? 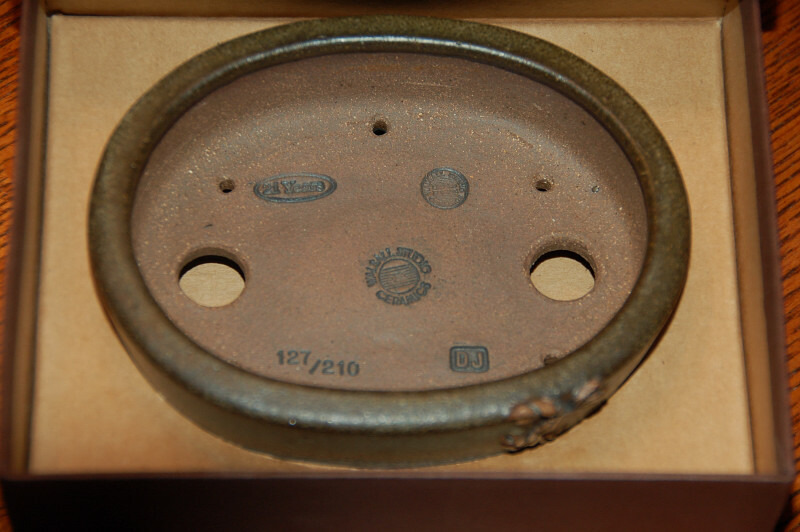 The pot is 5.5 inches in diameter and .75 inches tall. The glaze is streaked greys and very faint blues. The shape is a lotus blossom and the interior is combed. The potters name is Matsumoto Takashi from the Ryuugaku kiln.